There’s been some bad blood between football playing members of the North Coast Athletic Conference and the Ohio Athletic Conference ever since the NCAC was founded 1984, long before Wabash joined the NCAC in December 1998. Call it what you will (inferiority complex; superiority complex), but for at least the last decade, the OAC has had the last laugh when it comes to post-season, head-to-head competition between the two leagues. Mount Union, seven-time national champions, hasn’t lost to an NCAC school since 1990 when it fell to Allegheny. Since that time, the Purple Raiders of the OAC have blitzed Wabash, Allegheny, Wooster, and Wittenberg at every meeting. The Little Giants fell to Mount Union 45-16 in the NCAA quarterfinals in 2002; the Raiders went on to win their seventh title. But this Saturday when the OAC and NCAC clash in an NCAA Division III second round playoff game, it’s not Mount Union that is calling. Wabash (11-0) hosts Capital University (9-2) in a 12:00 p.m. EST contest with the winner drawing the winner of the Mount Union vs. Augustana tilt. Capital would like nothing better than to avenge a 42-24 loss to the Mount Union in week four of the 2005 season. But in order to get their rematch, the Crusaders must get past a Wabash team that appears ready for the challenges that OAC teams present. Wabash comes into Saturday’s game with Capital off a 38-20 win over Michigan Intercollegiate Athletic Conference champion Albion, and a 17-14 win over DePauw, which finished second to Trinity in the Southern Collegiate Athletic Conference. The early-week weather forecast calls for clear skies and cool temperatures in the 30s. Wabash has yet to play a game in wet, sloppy conditions in 2005, and its passing statistics reflect the good weather. Senior quarterback Russ Harbaugh, the NCAC Offensive Player of the Year, has completed 72 percent of his passes for 3,324 yards and 29 touchdowns. With only four interceptions in 351 attempts, Harbaugh’s pass efficiency is a staggering 176.3. Harbaugh is quick to give credit to his receiving corps, which man-for-man is Wabash’s most talented and deepest group in history. Five players boast 33 or more catches this year; five have caught four or more touchdown passes; four average better than 14 yards per catch; and six have caught passes longer than 36 yards. Senior Eric Summers is streaking late in the season and caught nine passes for 138 yards and a touchdown vs. Albion. For the year he leads the team with 58 catches, 858 receiving yards, and seven touchdowns. Geoff Walker (48-718-5), Mike Russell (41-592-6), and Kyle Piazza (41-382-2; pictured left) make it tough for defenses to key on Summers. And Ray Green (33-521-6) is a big play threat every time he touches the ball. The Little Giants’ passing game has only been slowed in one game all season. DePauw’s aggressive front and stingy secondary limited Harbaugh to a season-low 178 yards. Harbaugh cites DePauw’s changing defenses and wind conditions as partially responsible for the low output. DePauw’s pass defense was ranked seventh when Wabash played the Tigers. Capital appears to have the tools to at least slow Harbaugh and company even if weather is not a factor. The Crusaders are very fast and aggressive up front, registering 46 sacks and 108 tackles for loss in 11 games. The team has 22 interceptions and opponents net just 155 passing yards per game. 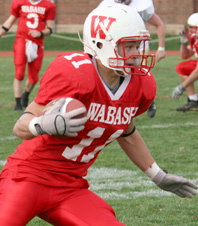 Senior safety Kyle Hausler is the best at his position Wabash will have faced this year. He’s fourth on the team in tackles with 48 and has a team-high six interceptions. Middle linebacker Joel Sickmeier is another terrific player. The 6-1, 233-pound senior flies to the ball, and his team-high 85 tackles, 14 tackles for loss, and two interceptions are impressive numbers. Corners Matt Coleman (49 tackles) and James Starks have combined for five interceptions, while nickel back Tom Coleman has three interceptions. The Crusaders will get pressure on Harbaugh with linebacker blitzes from Sickmeier and outside backers Bart Sparhawk (38 tackles, 6 for loss) and Sam Abdullah (53 tackles, 3.5 sacks). The defensive line isn’t huge, but have combined for an astonishing 20.5 sacks and 42 tackles for loss, which suggests Capital could have the fastest front Wabash’s offensive line has faced. 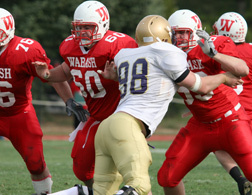 Wabash’s offensive line (pictured above right) performed well against Albion, limiting the Britons to one sack and giving Harbaugh time to complete 34-of-39 passes for 360 yards and three touchdowns. Wabash also gained 138 yards on the ground in the game. Offensively, Wabash has seen arguably better running backs than Capital’s Colin O’Reilly and better quarterbacks than Rocky Pentello. Perhaps Wabash hasn’t seen such a solid combination thus far. O’Reilly leads a deep running back corps with 923 yards and 11 touchdowns. Jeremy Mulkey came off the bench for a 100-plus yard game in Capital’s road victory at North Central last weekend. Pentello, though, drives the Crusader offense. He’s most efficient when O’Reilly is keeping defenses honest, but has the ability to beat teams single handedly. The 6-1, 215-pound junior averages 244 yards per game, completes 66 percent of his passes, and has thrown 24 touchdowns against 10 interceptions. His receiving corps is quite good, too. His top receiver is 6-6, 217-pound senior Lewis Howes, whose 69 catches and 741 yards lead the team. Kive Kraft has a team-high nine touchdown grabs and 59 receptions to his credit. Kraft, too, is big at 6-3 and 214 pounds. Wabash’s success vs. Albion and DePauw in recent weeks came from its ability to shut down opposing running backs. Albion’s quarterback was its leading rusher last week, while three tailbacks combined for just 12 yards on 11 carries. If Wabash can similarly shut down O’Reilly and get some pressure on Pentello, its chances for success are measurably better. For the first time in several weeks, linebacker Adrian Pynenberg was not Wabash’s leading tackler vs. Albion. That honor went to Aaron Selby, who made nine stops and one tackle for loss. Linebacker Tim Parker (pictured on the left) and end Peter Kempf each had six tackles and a sack, while Pynenberg had five hits and two for loss. Wabash’s secondary looked solid vs. Albion with Billy King and Thomas Bell intercepting passes. Playing some soft coverage with a lead allowed Albion to churn out 294 passing yards. Wabash will want to tighten up a bit this week versus a bigger receiving corps, and sharpen up its tackling as well. Matt Spitz is the best kicker Wabash has seen all year. The sophomore has converted 13-of-15 field goals and 31-of-34 extra points. Wabash counters with a much more consistent Chad Finley, who has field goals in his last two games and has been perfect on PATs in those windy contests. Wabash has gained advantage with its kick return teams in recent weeks. Geoff Walker, Billy King, and Mike Russell have been impressive, but kick coverage should improve this week in order for Wabash to contain dangerous returners O’Reilly (23.7 average) and Hausler (22 average). 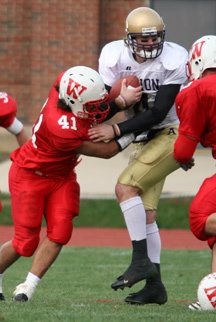 Richard Roomes has emerged as Wabash's special teams defensive star (pictured on a kickoff tackle at right). In Saturday's Albion game, Roomes had two tackles and recovered a blocked punt in the endzone.